All this hot summer weather makes me crave three things: crisp salads, fresh fruits and food with a Mexican flare. It brings me back to my Texas roots where Tex-Mex and authentic Mexican restaurants are everywhere. Chips with table-side guacamole and tacos or fajitas are my go-to so I am always up for a new twist on an old favorite to “get my fix”. Enter this tacos! Fruit + avocado + crunchy cabbage and crisp cauliflower in handheld form – hello summer! There’s something fun about eating with your hands, right? This flavor combination is a total win! I was blown away by it’s complexity – zesty lime juice, sweet fresh mango, warm and almost nutty cauliflower with crunchy cabbage and velvety avocado topped off with a tangy yogurt drizzle…wow. At first peek, both Melissa’s Crispy Avocado and BLT Salad and Buffalo Chicken Burgers with Spicy Celery Slaw called my name (who doesn’t love avocado, bacon and tomato?) but without eating nightshades, these recipes are “on hold” for now. Oh, and her Mexican Chocolate Tart with Cinnamon-Spiced Pecans looked and sounded sinfully delicious! 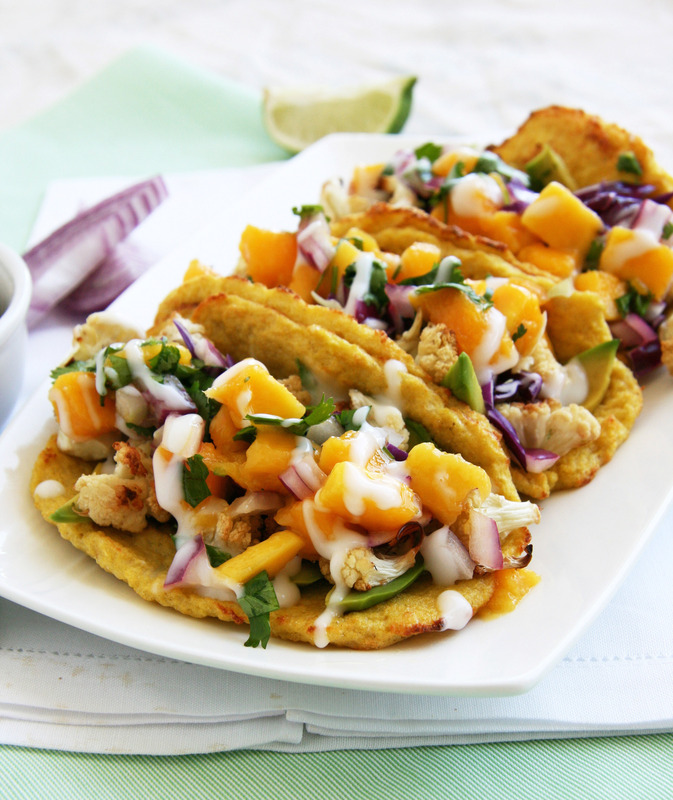 I ultimately chose her Crispy Cauliflower Tacos with Mango Salsa— love the concept, love the taste and YES, I will be making these again for sure! Based on my dietary restrictions, I switched up a few things. I made my own grain-free cauliflower tortillas but any tortillas can be subbed here (corn, gluten-free etc). I reduced the amount of oil bit and subbed finely crushed plantain chips for a grain-free swap for the breadcrumbs. I sliced the avocado instead if mashing and used dairy-free coconut milk yogurt in place of the the sour cream. In the mango salsa, I eliminated the jalapeño (nightshade) and didn’t miss it at all! 1. Combine the mango, onion, jalapeño (if using), and garlic in a bowl. Toss with lime juice and fold in cilantro. 2. Season with salt and pepper, to taste, and set aside. 1. Working in batches, heat half of the oil in a skillet over medium-high heat. Add the cauliflower and cook until golden brown, stirring occasionally, about 7-10 minutes. 2. Toss with half of the panko/plantain/chips and cook until have become golden brown, 2-3 minutes. 3. Season with salt and pepper, to taste. Remove the cauliflower from the skillet into a bowl and repeat with the remaining oil, cauliflower, and panko/plaintain/chips. 1. To assemble tacos, mash the avocado with the lime juice. 2. 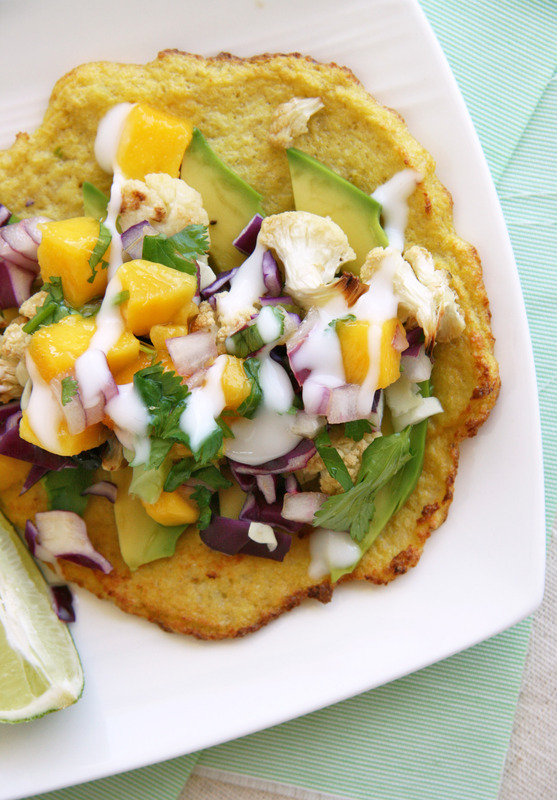 Spread some avocado onto a tortilla and top with cabbage, cauliflower, salsa, and sour cream. 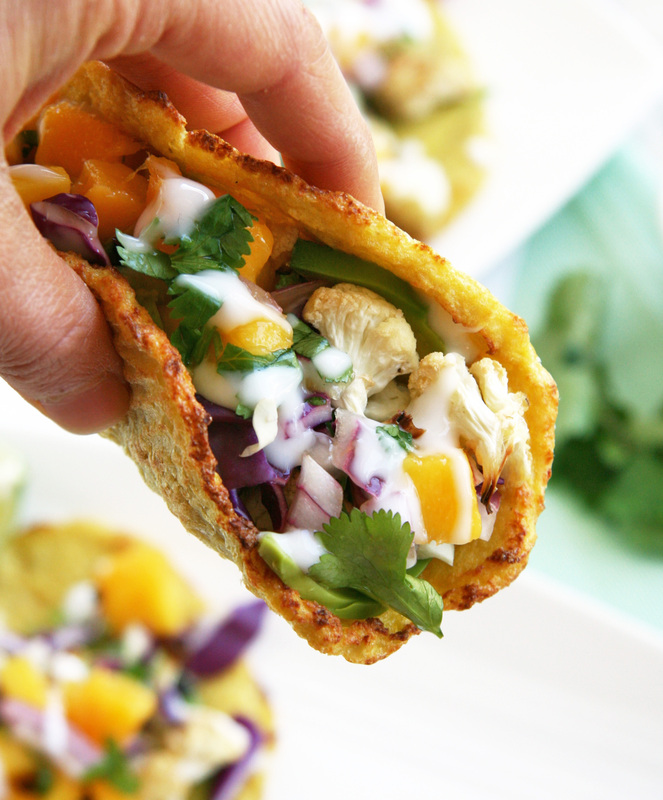 that is super creative, cauliflower tacos! 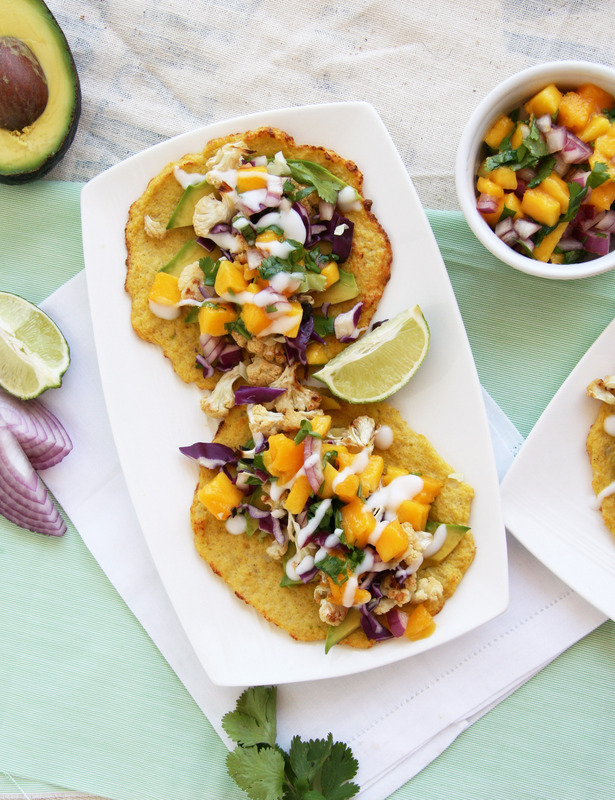 I love cauliflower anything, but never tried to use it as a main ingredient in tacos… love it! 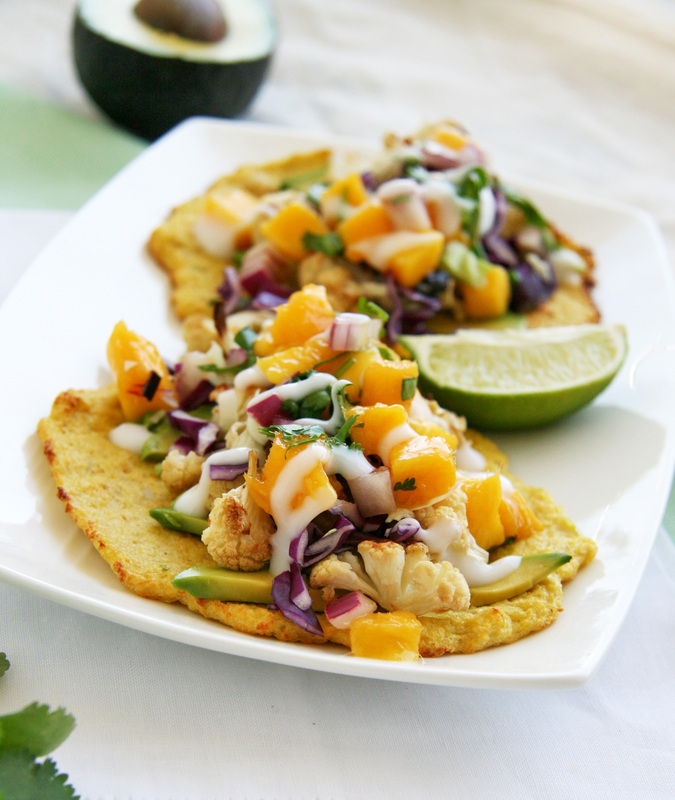 I love that you made your own taco shells and that they are made from cauliflower! I must learn. I too,am curious of a cauliflower taco tortilla. Could you supply the recipe and directions please? Yes! I’ll post it soon ! Oh my goodness – those look like summer on a plate. Gorgeous fresh veggies and bright colors! These sound so interesting. My husband is a huge fan of cauliflower, go figure. He would love this recipe! Happy Reveal Day! Interesting. I love shredded cabbage. Absolutely love mango salsa! I’ve never paired it with cauliflower before. looks delicious! What a perfect meatless entree. I love, love, love cauliflower, but I have to admit I never would have thought to put it in a taco. Now I can’t wait to try it, and I bet it works so well with the mango salsa. This will definitely be making an appearance at my place very soon. Such beautiful colors! A wonderful selection this month. Looks great! I am interested in this in a major way!